Good fit and they dry very fast! My 9 year old son loves them! 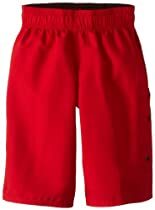 They dry quickly and are roomy enough in the behind/thighs to allow for an active boy to play without the trunks pulling down when he bends over. Recommended!!! I bought them for my 17 year old son and they didn't fit. I will pass them on to one of my nephews.